I've said this so many times about the bullet journal, but one of my favorite things about the system is that you can do pretty much do whatever you want with the system. Because you make things yourself, you have the freedom to create everything to your own tastes. However, something I've definitely fallen into the trap of (and I'd assume others have, too) is sticking with things in my system just because I feel like have to, and this can lead to a bujo slump. 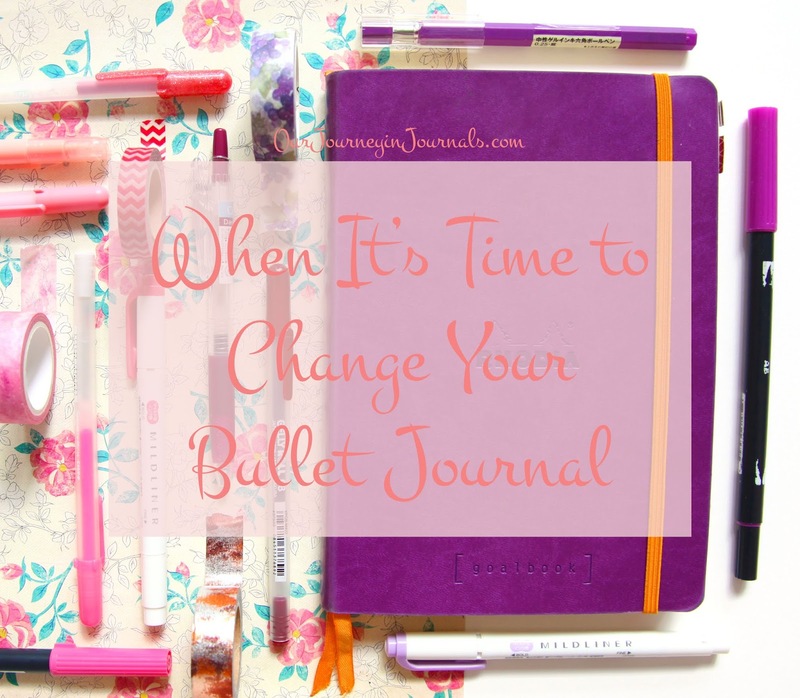 Today, I'll be discussing how to know that it's time to change something up your bullet journal system. When it comes to continuing to implement an aspect of your bullet journal, there are a main couple of things that you should keep in mind. Does it make you happy, is it fun to do, etc.? For example, my daily spreads always have hand-lettered headers. Is it not necessarily the most practical thing to do, and does it take some effort and time? Yes, but I also enjoy the act of calligraphy itself, and I like seeing my bullet journal all ~aesthetic~. Bullet journaling as a whole is more laborious than a pre-printed planner, so if you put in that work to maintain a bujo, it should be an activity that you have fun doing. If there are parts of your bullet journal that are like pulling teeth, then you should take a look at whether or not they're really worth doing. Another big factor to consider is whether or not it actually helps you in your life. If something isn't enjoyable to do, it can still be worth continuing to do if it makes you more productive, helps build good habits, helps keep you organized, etc. However, if something in your bullet journal system is neither fun to do nor helps you out in some aspect of your life, then you should reflect on the necessity of it. For example, I used to do a monthly habit tracker ever since I began bullet journaling (April of 2016), but it came to be a huge hassle to fill in every day. In fact, it got to the point where I was filling things in several days behind, and I had to try to remember whether or not I had actually done the things in my habit tracker. In general, but especially because I was now low-key fudging my data, tracking my habits no longer encouraged me to do them more often. All in all, it was a lot of extra effort that was not fun and really did not help me at all, so in the October of 2017, I finally gave up on my monthly habit tracker. This kind of goes along with my habit tracker thing, but your life is constantly evolving. Thus, your bullet journal system and the things you need from it will naturally most likely need to change, particularly when there are big things that happen in your life (like starting college, moving out, having your first child, etc.). You may discover that something that used to work no longer works, and so you shouldn't be afraid to try something out that may be better for you in this current phase of your life. That change you need may be in the form of something as small as implementing a new section in your monthly spread or as big as switching from a traditional bound journal to a digital system. Like I said earlier, being able to essentially instantly alter your bujo is one of its greatest features! I hope these tips helped you in being able to determine whether or not you need to change up your bullet journal, whether it's your entire system as a whole or just certain aspects of it. Good luck in your future bujo endeavors, and remember to not stick with something just for the sake of sticking with it! What's something in your bullet journal that's changed since you first started it? Comment it down below!